This page is dedicated to my unforgettable teacher of East-Asian Art at Heidelberg University. LINKs to my books are at the end. Though Buddhism imposes no ban on pictures, a basic principle – „Thou canst not, art not able to make images“ – still applies. Dietrich Seckel’s study addresses this aniconism. It focuses above all on development of Buddhist symbols, casts light on later eras’ lack of images, and pursues the new symbols of Mahayana Buddhism. The original German edition of 1976 belongs to the German-language area’s standard works of East Asia’s history of art. To enable the work to reach an international audience, Artibus Asiae Publishers is now issuing a licensed English edition. 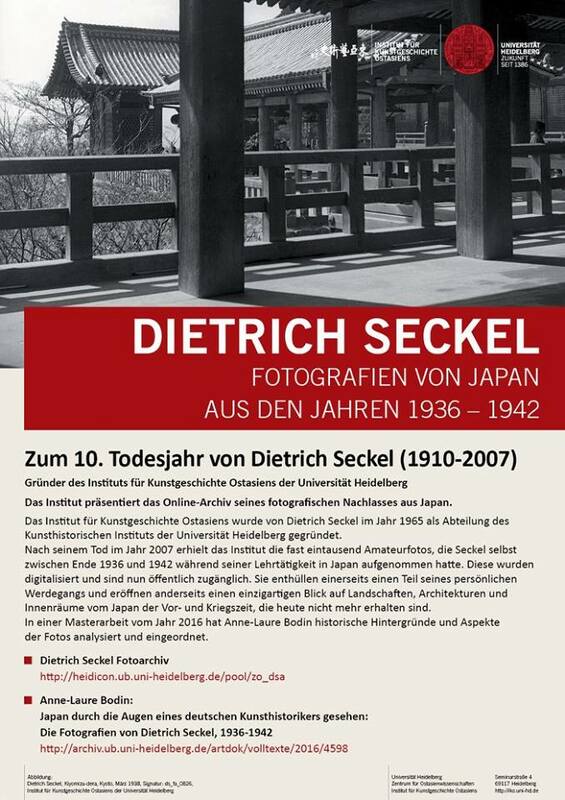 Until 1976 Dietrich Seckel was active as a professor of East Asian art history at the University of Heidelberg. At the moment he is working on the fourth volume of his work "Das Porträt in Ostasien" [The portrait in East Asia]. The ultimate goal of Zen art is the No-Longer-Symbol: the empty picture, the ‘picture’ as emptiness, the shapeless shape, the ‘thundering silence’. The highest truth is without image. But if there were no image there would be no possibility for the truth to manifest itself. The highest principle is without words. But if there were no words how could be principle be known?" "The majesty of God, which is beyond the reach of any eye, must not be dishonoured by becoming representation." "The ultimate goal of Zen art is the No-Longer-Symbol: the empty picture, the ‘picture’ as emptiness, the shapeless shape, the ‘thundering silence’." ONE knows the image well: the body firm and erect but not tense, dew-drop freshness on the face, the eyes gentle, gaze firmly fixed on the tip of the nose, the expression one of utter peace bespeaking a mind inwardly turned, like a yogi’s, a ‘flicker-less lamp burning in a windless place’. But the Buddha was not rendered like this from the beginning. There was no rendering of him in human form at all for close to half a millennium after the founding of the faith. Where does all this come from then, this construct, and this manner of approaching him? And where does all this lead? Dietrich Seckel, whose classic work on the Buddhist art has set the standards of scholarship for upwards of a generation, takes us through all this, and through the minefield of conflicting ideas about image-making, in a study that has become available only recently in an English version. Translated from the original German that first appeared nearly 30 years ago — and one owes this publication in equal measure to that remarkable Zurich-based journal, Artibus Asiae, and to Helmut Brinker and John Rosenfield, two distinguished scholars, long associated with Professor Seckel, who have edited the volume — the work is now titled Before and Beyond the Image. It is a magisterial account, subtle and layered like the doctrine that it explores as it proceeds. Art, in this case, the image of the Buddha, remains the central focus, but the world of thought unfolds all around the reader in these pages. It starts, naturally, with things that one knows from close: the ‘representation’ more accurately, a suggestion of the presence, of the Buddha in early sculptures from India not in his human form but aniconically, through some symbol or the other: footprints, parasol, wheel, the Bodhi tree, an unoccupied throne, and the like. In sculpted panels, devotees crowd together in an assembly to hear the Master speak, but all that one sees in place of him, is an empty throne; Sujata brings humble offerings to the Lord seated under a tree, but the tree is him, as the sculptor renders it. Sacred footprints are not only objects of contemplation and adoration, but become endowed with magical powers, for in them one sees Him. And so on. All on account of the stated belief about his being beyond representation, his transcendence of the phenomenal world. But, with time, ideological changes come about, and Professor Seckel takes us through them, step by considered step. By the second century AD, the Mahayana doctrine comes in; popular beliefs, and needs, take over; the ancient figure of the seated ascetic and teacher is easily adapted to the form of the Buddha; a whole iconography develops. We get Mathura and Gandhara and Sarnath. But, most engagingly, as Professor Seckel points out, the image, seductive as it is, does not displace the symbol completely. For as we move towards the Far East, in particular Japan — an area that is like home to Prof. Seckel — symbols, and symbolic representation of the Buddha, continue to occupy central place in art and thought. The nothingness, the emptiness of Nirvana, which is the highest goal in Buddhist belief, is best understood there not through a figure but a symbol. The more abstract a visual sign is, the truer and more effective it is, in this manner of thinking. The concept of ‘circle’, or ‘round’, best represents timeless eternity without beginning or end; mudras become replete with and express the ultimate truth; mystic-magical syllables, or words written in siddha characters, contain the essence. We move through subtle ideas, images light as air, sounds that stay unstruck. It is a fascinating, deeply absorbing journey. And none of it is without relevance even to the present day, and even in our immediate context. For we keep constantly, and still, engaging with opposites that are embedded deep in our own awareness: the idea of the godhead being nirguna (emptied of attributes) or saguna (possessed of attributes); of the Supreme Spirit being niraakaara or saakaara: devoid of form or clothed in it. Streams continue to run parallel, at least in our land. .... The general Buddhist teaching, which teaches saving all the sentient beings through obtaining enlightenment, and overcoming suffering that comes from existence itself, went through slight changes according to the time and place. Even with such changes, since Buddhism has strong appeal beyond any particular race or social group, it could grow as a world religion. Sometimes Buddhism was oppressed when it was introduced to other countries, especially if the country had ancient beliefs like Indian Hinduism or the Sinocentrism of China, based on Daoism and Confucianism. 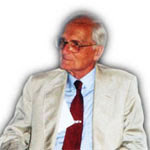 Nevertheless, as Dietrich Seckel, a German art historian, said, eventually Buddhism was able to release the shackles that social structure, rules of action, and myths of countries like India, China, and Japan had put on people, and lead those people to new territory of thought, and make people realize the true meaning of freedom. At the same time, Buddhism made a great contribution to raising the cultural level of adjacent nations. The most emphasized Buddhist concepts are the personal value and the freedom of thought that help it be developed and embellished by generations one after another. The freedom of thinking is the most essentials of all and no wonders Buddhism has been widespread and welcome all over the world while no warring conflicts are known in the history of its religious propagation at all. “It will be appreciated that this was not the foundation upon which one could establish an obligatory dogma. Hence Buddhism could easily adapt itself to alien ways of thinking, doctrines and cultural conditions, without sacrificing its basic concepts. This of course meant that it had to renounce the lives and thoughts of the people under its sway… It was presumably this modesty in its claims that enabled it to spread peacefully into such vast areas, where the cultural pattern was so different. " Over two millenniums of existence with the peace-loving peoples on the eastern part of the world, Buddhism never ceases to develop and open up new dimensions of spiritual life, thought and feeling. ..... The stupa is, I suggest, such a `hypoicon', i.e. not a pure icon, but a symbol with iconic features. As such it is at least partly conventional. Interestingly it is this feature that provides a context for understanding the importance of ritual practice in inculcating an understanding of the general conventions which govern the use of such a sign. (10) The most spectacular example of this sort of phenomenon, however, is not actually located in India. It is the stupendous, multi-levelled Buddhist monument at Borobudur in Java. `Borobudur has rightly been called a psychophysical pilgrim's path: the terraces lead the pilgrim through the different cosmic spheres, levels of apprehension, and stages of redemption. It is an initiation course into the Buddhist faith, executed in stone' . They take something that is in its essence beyond form but reveals itself in visionary forms adapted to our earthly ability for visualization and conceptualization. "Taigenkyu, das Heiligtum des Yuiitsu-Shinto. Eine Studie zur Symbolik und Geschichte der japanischen Architektur." Professor Dr. Dietrich Seckel zu Gast bei "Erlebte Geschichte - erzählt"
Professor Dr. Dietrich Seckel ist am Sonntag, 2. Dezember, um 17 Uhr Gesprächsgast von Michael Buselmeier in der Reihe "Erlebte Geschichte - erzählt" im Spiegelsaal des Prinz Carl, Kornmarkt 1. Veranstalter ist das Kulturamt der Stadt Heidelberg. Der Lebens- und Ausbildungsweg Dietrich Seckels ist nicht immer gerade verlaufen. Geboren wurde er 1910 als Sohn eines Jura-Professors in Berlin. Nach dem Abitur im Jahr 1928 studierte er in Berlin Germanistik und Kunstgeschichte und promovierte 1936 bei dem berühmten Julius Petersen über den Sprachrhythmus Hölderlins. Auf Anraten seines Lehrers Petersen reiste Dietrich Seckel im selben Jahr nach Japan, um zunächst in Hiroshima und zwei Jahre später in Tokio als Deutschlehrer zu arbeiten. Während seines Japan-Aufenthalts arbeitete er sich autodidaktisch in die ostasiatische Kunstgeschichte ein. Zurück in Deutschland habilitierte er sich im Jahr 1948 in Heidelberg bei August Grisebach. Anfang der fünfziger Jahre bekam er eine Stelle als Professor, Wissenschaftlicher Rat und leitete zeitweise das Studium Generale. 1962 erschien in der vielbändigen Reihe "Kunst der Welt" Seckels Standardwerk "Kunst des Buddhismus". 1965 wurde er Ordinarius, 1976 wurde er emeritiert. Zur Zeit arbeitet Dietrich Seckel am dritten Band seines Werkes "Das Porträt in der ostasiatischen Kunst". Der Privatdozent Dietrich Seckel, der seit dem Sommersemester 1949 am Kunsthistorischen Institut lehrte, gründetete die Ostasiatische Abteilung des kunsthistorischen Institutes der Universität Heidelberg. Forschung und Lehre wurden seit 1947 sukzessiv in der Ostasiatischen Abteilung des Kunsthistorischen Instituts aufgebaut, konzipiert als Teil einer umfassenden Reihe von Seminaren zur Weltkunstgeschichte. Bis zur Einrichtung eines Lehrstuhles für ostasiatische Kunstgeschichte an der FU Berlin (2003) stellte Heidelberg die einzige spezialisierte Forschungs- und Ausbildungsstätte für Kunstgeschichte Ostasiens in Deutschland dar. 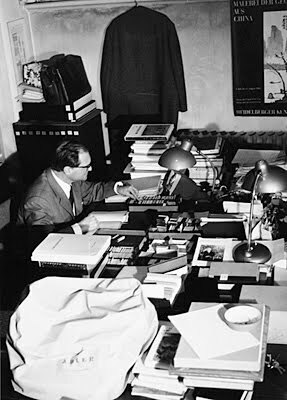 Die Etablierung des Faches in Deutschland ist eng verbunden mit der Lebensleistung von Dietrich Seckel (1910-2007), der sich nach seiner Rückkehr von einem zehnjährigem Japanaufenthalt 1948 in Heidelberg habilitierte, damals in einem noch nicht institutionalisierten Fach. 1965 wurde für ihn der erste Lehrstuhl eingerichtet. 1976 folgte Lothar Ledderose als zweiter Lehrstuhlinhaber nach. 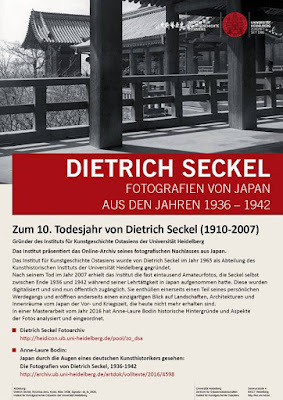 Von 1936 bis 1947 unterrichtete Dietrich Seckel (1910-2007) als junger Lektor die deutsche Sprache in Japan. Als 26 jähriger Mann spielte diese Periode eine entscheidende Rolle in seiner Entdeckung der ostasiatischen Kunst im Allgemein und der japanischen Kunst im Besonderen. Nach seiner Rückkehr nach Deutschland unterrichete er Kunstgeschichte Ostasiens an der Universität Heidelberg und wurde ab 1965 zum ersten Lehrstuhlinhaber des Faches ostasiatische Kunst. Nach seinem Tod im Jahr 2007 erhielt die Diathek des Instituts das Vermächtnis von fast eintausend Fotografien, die Seckel im Laufe seines Japanaufenthalts aufgenommen hatte. Diese Bilder bieten einen reichen, vielfältigen und häufig bewegenden, visuellen Bericht eines Deutschen im Japan der Vor- und Kriegszeit. Diese Masterarbeit beschäftigt sich mit der Analyse dieses fotografischen Bestands, der 2015 vollständig digitalisiert wurde und der jetzt u.a. auf der digitalen Bilddatenbank HeidIcon der Universitätsbibliothek einsehbar ist. In drei Kapiteln ist das Ziel der Arbeit dieses „Dietrich Seckel Archiv“ zu untersuchen, zu kategorisieren und in historischer und kunsthistorischer Hinsicht zu kontextualisieren. Dafür ist die Berücksichtigung des gesamten analogen Fotomaterials inklusive deren Verpackung sowie der Primärquellen des Seckel-Nachlasses von besonderer Bedeutung. Ein Schwerpunkt liegt auf dem, so weit möglich, Abgleich von Fotos und Briefen, die Seckel an seine Mutter zwischen 1936 und 1941 schrieb. Beide Medien ergänzen sich und sind untrennbar miteinander verbunden. Die Briefe enthüllen und erklären den Sinn von jedem Bild und erlauben diese Fotos in mehrere ikonografischen Kategorien einzuordnen. Alltag-, Natur- und Architekturaufnahmen, die diesen Bestand bestimmen, zeigen einerseits ein Beispiel der Amateurfotografie in Japan in dieser Zeit und andererseits die Wichtigkeit der Fotografie als Hilfe für die wissenschaftlichen Schriften des künftigen Kunsthistorikers Seckel, die aus seiner ersten Untersuchungen der japanischen Architektur resultierten. Der Bildanhang der Masterarbeit stellt eine Auswahl von mehr als 240 fortlaufend nummerierten Fotos von Seckel zum Text der Arbeit, zu denen etwa 30 Fotos zeitgleicher Amateurfotographen in Japan hinzukommen. Dazu finden sich auch Abbildungen aus wissenschaftlichen Schriften Seckels, die seine publizierten Fotos zeigen, sowie drei Übersichtskarten Japans mit Orten, die Seckel zwischen Anfang 1937 und August 1941 besichtigte.